Asma Al Abidi in Tunis, Ali Al-Qataani in Sabha, and Zeinab Mohammed Salih in Khartoum collaborated with The Local Italy for a feature about Italy’s deal with Libyan human smugglers to create a border patrol and extend EU borders. To view the story on The Local Italy’s site, click here. A Touareg tribesman walks in the Meggedat valley, northwest Libya, in the desert of the western Ghat District. Photo: Taha Jawashi/AFP. Correspondents for The Local Italy spoke to a people smuggler in southern Libya who said Italy’s plans to pay people not to engage in human trafficking are working. But he expects the lull to be temporary. Ahmed *Essa’s business, like any other, operates under the basic principles of supply and demand. A 28-year-old Libyan from the minority Toubou ethnic group, Essa smuggles desperate migrants fleeing violence and poverty from Niger to the southern Libyan city of Sabha. This is the first leg on a commonly-used route toward the Libyan coast, which will enable Essa’s “African brothers” to get closer to their dream destinations in Europe. Essa’s trade is currently witnessing an ebb. The number of African migrants arriving in Italy in July was half the number of the same time last year, according to METE (Multiculturalism, Earth, Territory, Education), a Palermo-based organization that assists refugees who have landed on the Sicilian coast. Apart from EU funds pumped into Libya’s naval forces, the drop in migrant numbers could also be a result of a deal struck in April between Italy and members of the Toubou, Tuareg and Awlad Sulaiman ethnic communities – who dominate the smuggling ring in southern Libya – to create a border patrol to stop the flow of migrants. In other words, Italy is paying smugglers not to engage in smuggling – a lucrative business in a marginalized and economically depressed area of Libya where the UN-backed government has little control. Essa, who says there are no other jobs in southern Libya, seems confident that the “slump” in business will not last. “Even the United States, a big power, cannot secure its border with Mexico,” Essa told The Local. “And the Mexican border with the US is smaller. The Libyan borders are very, very huge.” Libya shares borders with six countries, some of which remain porous in the security dearth left since Muammar Gaddafi’s ousting in 2011. “The reason for the reduction in landings, I believe, is due to the Italian government’s policy and the intervention measures adopted,” said Giorgia Butera, President of METE. The Italian government, together with EU partners and the heads of state of Niger, Libya and Chad, agreed in August to fund projects to strengthen domestic policing capacity in North Africa, together with a humanitarian aid package, to enforce Italy’s blueprint. But Butera is wary of deals with smugglers. “There can be no dialogue with those who kill and torture people,” she said, referring to accounts of smugglers abusing, torturing and enslaving migrants in southern Libya, which was documented in a report released earlier this year by the International Organization for Migration (IOM). Hassan*, a 31-year-old Senegalese man, who left behind a wife and two small children, paid smugglers €1,250 ($1,500) just to get to Sabha. There, he lives in a warehouse and works in construction to raise enough money for the boat trip to Italy and to send money back to his wife. Back in his home city of Kolakh, Senegal, Hassan did every job from working as a salesman in a shop to herding sheep, but nothing covered the cost of feeding his family. Like many sub-Saharan Africans caught in limbo in Sabha, Hassan has experienced harassment and physical abuse from smugglers. “They think they will find work in Libya but then find out that the smuggler who brought them all the way to Libya has already sold them to another person,” said Reem Bourarouj, a Tunisian physician with Doctors without Borders who treated migrants while working on humanitarian rescue missions aboard the Aquarius. Hassan was afraid to talk about who beat him up. The smuggling world is small, and he still needs to travel north. A Libyan Hassan has met has assured him that he will safely make it to Italy. Essa insisted that the Toubou were not involved in slavery. He shifted the blame onto other ethnic groups, with whom the Toubou have had long, bloody conflicts. A life boat carrying the bodies of 29 refugees and migrants, who died on a rubber boat north of Libya while crossing the Mediterranean Sea, is dragged by a sailing boat of the Spanish NGO Proactiva Open Arms on October 5, 2016. Photo: Aris Messinis/AFP. At least 2,542 people have died trying to cross the Mediterranean from North Africa or the Middle East in 2017 alone, according to Missing Migrants, an organization that tracks deaths along migratory routes. Essa said that young men like himself were also victims of racial and ethnic discrimination within Libya dating back to life under Gaddafi. Essa had very different plans for his future after graduating with a degree in oil engineering. Essa said that the governments since Gaddafi have continued in discriminating minority groups, who were only given access to education, healthcare and citizenship once the uprisings against him began. “My cousins, who are PhD holders, are now working in human smuggling because of the systemic racism against my people,” Essa said. In Malta earlier this year, European Union leaders agreed to pay Libya (including its navy) approximately €180 million ($215 million) to stop migrant boats in its territorial waters as well as establish “safe” refugee camps in Libya. General Ayoub Qassem, spokesman for the Libyan Navy, said the navy was the reason for fewer migrants. “Illegal immigration has been reduced because immigrants no longer find taxis to transport them to Europe,” Qassem told The Local. “They find coast guards to bring them back where they should be,” said Qassem. “They are infiltrators who take advantage of the global propaganda on migration. They are from 30 stable and safe African and non-African countries. They can live a decent life in their own countries,” added General Qassem. Qassem was particularly critical of rescue missions. “They encourage illegal immigration, encourage smugglers and save more boats,” he said. Reporting by: Zeinab Mohammed Salih in Khartoum, Asma Al-Abidi in Tunis, Ali Al-Qataani in Sabha and Rose-Anne Clermont in Berlin. All contributors are part of the MiCT journalism platform Correspondents. *Names changed for their safety. 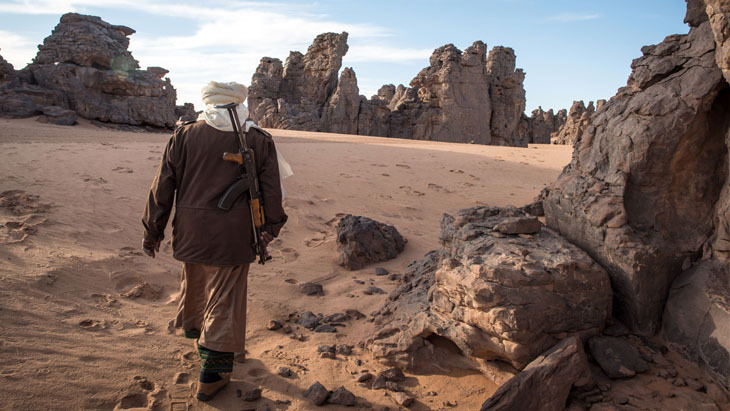 Has ISIS Regrouped in Southern Libya?